(Nanowerk News) A North Carolina State University physicist and his German colleagues have created a new, more precise algorithm for simulating particle interactions when a single impurity is introduced into a Fermi sea. The algorithm shows that when these particles interact, the transition from quasiparticle to bound molecule in a polarized two-dimensional system is smooth. The new method may have implications for understanding the behavior of impurities in a variety of systems. The Fermi sea describes a collection of weakly interacting identical fermions such as electrons that have been cooled to a very low temperature. No two fermions within the sea have exactly the same quantum state. The ground state of the Fermi sea in this pure form is well understood. However, what happens when an impurity – such as a particle with a different spin – is introduced? How does that one particle affect the system as a whole? 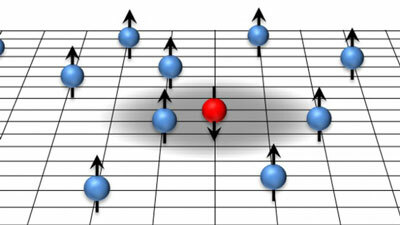 A single down-spin impurity surrounded by a Fermi sea of up-spin particles in two dimensions. Lee and his colleagues, lead author Shahin Bour and Ulf-G. Meissner from Bonn University and Hans-Werner Hammer from Darmstadt University, developed a lattice algorithm called impurity lattice Monte Carlo that samples the possible paths of the impurity in the Fermi sea. Monte Carlo methods are commonly used to simulate quantum mechanical systems. Impurity lattice Monte Carlo differs from other methods in that it treats the impurity particle explicitly, in a completely different manner from the other particles in the system. According to the lattice results, the transition from single particle to bound molecule is smooth. “Physicists had theorized that there should be a clear critical value, or interaction strength, where the impurity would bond with another particle and become a molecule,” Lee says, “but our simulations don’t show that. Instead, we find that there’s an interesting ambiguous state where the particles are interacting, but may or may not be a bound molecule. And when the transition does happen, it occurs smoothly as a function of interaction strength.